Two years after the introduction of its first ladies’ watch collection named Emotion, Louis Erard is presenting four new models that are sure to win women’s hearts. These exclusively mechanical Swiss made Louis Erard watches, inspired by fine watchmaking principles, are available at particularly affordable prices. 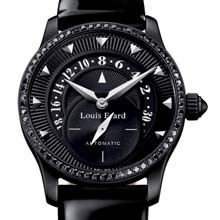 A patent leather strap teamed with black diamonds; an offset heart on a mother-of-pearl background; plays on metal-accented structures; or moon phases beneath a diamond-studded sky for incorrigible dreamers… This autumn, Louis Erard has decided to offer every woman the perfect match for her wrist. While the different variations will appeal to women with very different personalities, they share two common denominators: strict compliance with the principles of fine watchmaking; and affordable pricing. 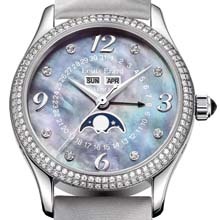 Very few Swiss watchmakers offer mechanical timepieces at less than € 400.- (as in the Héritage men’s collection), or versions set with 152 Top Wesselton diamonds totalling 1.4 carats for less than € 4’000.-, such as the brand-new 1931 Moon Phase Diamonds model. Emotion is expressed here in many different ways. With its metal bracelet, diamond hour-markers and original large date display (ref. 91 601 AA 50), this model will win the hearts of active women radiating classical elegance and who love to stand out from the crowd. They will find themselves reflected in this subtle and authentic range. Meanwhile, intrepid beauties will doubtless go for the Asymétrique Diamonds (ref. 92 602 SE 01) with its boldly off-centred hand-setting. Adorned with 64 diamonds and teamed with a trendy patent leather strap and an all-black dial and case, the Emotion Black Diamonds (ref. 92 601 NS 02) will prove an ideal companion for urban women firmly in step with the times. Refined, inspired, graceful: the 1931 Moon Phase Diamonds (ref. 44 204 SE 11) is sure to thrill ultra-feminine souls in search of absolute beauty. 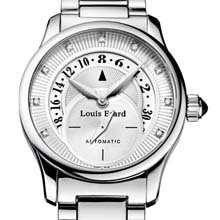 While the 1931 Collection embodies the very spirit of the Louis Erard brand, this Haute Horlogerie argument is endowed with a significant  number of assets. Mother-of-pearl and satin evoke gentleness; the moon phases and river of diamonds conjure up dreams; while the useful small complications enhance daily living. The quintessence of beauty dedicated to modern women.